Thank you for visiting GetawayFishingCharters.com – Sportsfishing at its best on Lake Ontario! 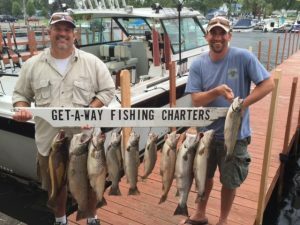 Our fishing charter is based out of Sodus Point, New York. Located on Lake Ontario half-way between Rochester and Syracuse, it is convenient from anywhere in New York and all surrounding states. With years of experience, Captain Dan is licensed by the United States Coast Guard, Red Cross first aid certified & CPR trained. Our charter boat is fully insured and equipped with the most sate-of-the-art electronic equipment available. Large groups are welcome and additional boats are available if needed. All fishing tackle and equipment is provided.